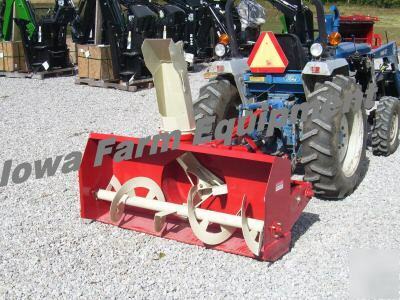 Brand New Farm King Y500, 60" Snowblower. * Suitable for all 15 to 30HP Tractors with Category 1 Hitches & 540 RPM PTO's. * Hitch Adjustment has 4 horizontal positions. * Plus, this Y500 is Quick Hitch Compatible! * Chute Control is manual and the handle is accessible while seated on most Tractors. * Deflector Control is also Manual with 6 positions varying from 30 to 80 degrees. * Cutting Width is a full 50" and the Height is a full 25". * 3 Blade Fan Diameter is 20". * Auger Diameter is 13" and is run with a #50 Chain. * Snowblower comes Complete including the PTO Shaft & Adjustable Skid Shoes! REMEMBER, NO SALES TAX ON OUT OF STATE SALES!